Test connection failed because of an error initializing provider. Could not find installable ISAM. These errors occur if you do not have the appropriate driver installed to import data from ACCDB files. Fortunately, it's easily solved. Importing Microsoft Access MDB databases into SQL Server is a built in feature of SQL Server. However, because of the difference between the database engine of the ACCDB file format introduced with Microsoft Access 2007, it is not possible to connect to the Access 2007 database using the built-in data source "Microsoft Access". You can use this if you wish to import data from a MDB format, but not an ACCDB from MS Access 2007 or later. 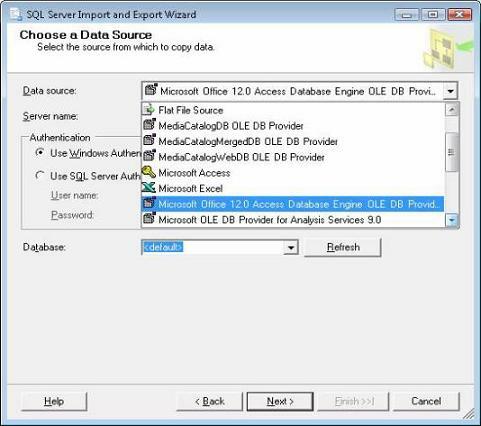 Before importing data from a Microsoft Access ACCDB database, you must install the OLEDB Provider for Microsoft Office 12.0 Access Database Engine. Microsoft offers free download of Microsoft Office System 2007 driver on their website. After installing the 2007 Office System driver, you will see another Data Source option, "Microsoft Office 12.0 Access Database Engine", when importing data into SQL Server. Use that and your data is imported as expected. Microsoft SQL Server Management Studio can now import your ACCDB databases.